The Japanese Terrier is an extremely rare breed, even in Japan where it was first developed. They are small, lively, affectionate and loyal, making them a popular choice as a pet dog. You'll may find them lounging on the sofa, but they do need exercise to keep the mind and body active. A 30-minute walk is all that is necessary to keep the Japanese Terrier happy. Their sensitive nature makes them well suited to singles, couples, and families that have older kids. Loud, rambunctious children can scare them so this type of environment is not recommended. Typical of the terrier breeds that went into their development The Japanese Terrier is a balanced, square dog, with a smooth, slick and short coat. Their heads are almost always black with a white body that has little black spots. They hold their ears upright and their tails are normally docked in Japan. In countries where tails are not permitted to be docked, the tail is slightly curved and tapered at the end. They tend to tolerate the heat better than the cold and will need a sweater or coat if living in a cold climate. Good with other pets: They are good with other dogs and cats but should not be trusted around small pocket pets such as hamsters or gerbils because they will be seen as possible prey. This is a very rare dog breed even in Japan. 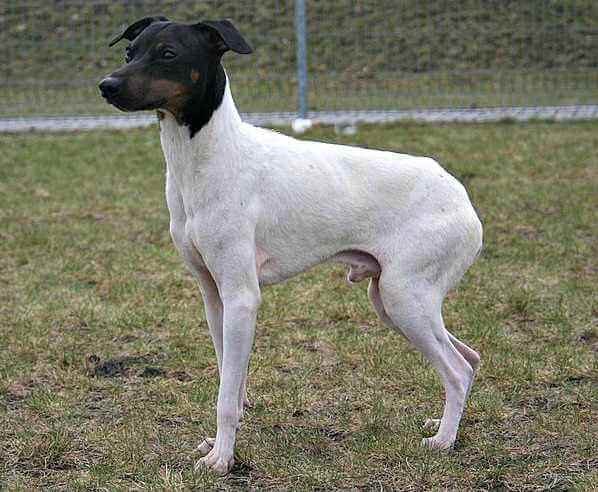 It is generally assumed that they descended from Smooth Fox Terriers who arrived with Dutch sailors in the 17th century and have remained throughout the centuries similar in size and even colors. 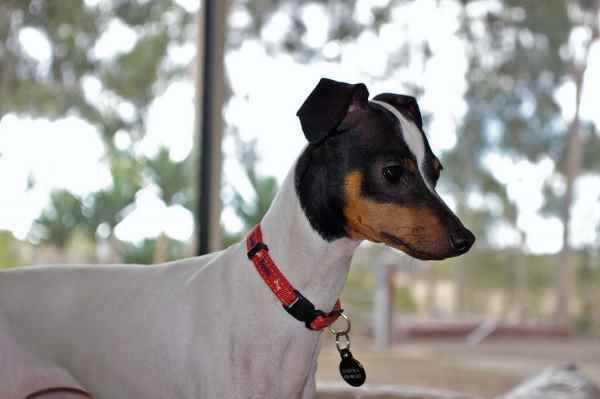 Even so, there is some confusion as to whether the Japanese Terrier descended from the Dutch Boerenfox (a Dutch terrier strain, like the Fox Terrier of England or the German Pinscher of Germany). Alternately, they could have been dogs brought by English sailors at approximately the same time. Whichever was the original breed they all arrived in the ports of Nagasaki, because was the only port open to the West. These little dogs quickly became popular because their size made them ideal lap dogs and companions. Their ancestors were originally used to manage the vermin population both onboard merchant ships as well as on land. The Japanese Terrier may have been used for this purpose, but they were primarily developed as a companion. Once in Japan, they were bred with local dogs and small pointer type dogs. By the 1930s, a fairly standard type emerged and was a popular companion and lap dog in the Japanese cities of Nagasaki, Kobe and Yokohama. They were first recognized by the Japanese Kennel Club in 1930. This very rare breed nearly vanished in 2nd World War when Japan faced tough times. They did reimerge and was first accepted by the FCI in 1998. These were admitted to United Kennel Club in 2006. This breed is very loyal and charming and a bit home spirited as well. They have a calm and friendly nature. The temperament of Japanese Terriers is playful and actively agile but they can also show signs of mischief from time to time. They adapt to urban life and can stay in Flats and apartments with some daily exercise and a routine that consists of walks. Also known as Nipon Terrier or Nihon Terrier, this breed finds it difficult to accommodate itself to extreme climate conditions and needs blankets to keep itself warm in winters. Terriers love their toys. They get super excited when they receive a new toy as a gift. Nihon Terriers are companion dogs and they like to interact with family members. They tend to be rather possessive of certain family members who they feel close. They enjoy playing with older children but I would advise parents to keep smaller children away from this breed of dogs. They hate loud noises and the terrier instincts may come out when you least expect it to happen. Japanese Terriers have the ability to become good watchdogs as they can hear even slightest of voices and have good eyesight as well. They don't, however, make good guard dogs due to their size. Grooming is a breeze with this breed. A brush with soft bristles, cloth, or rubber curry glove is all that is needed once in awhile. Brushing will help with shedding but these dogs are not known to be big shedders. A bath when dirty is also recommended. Other than that, their teeth should be brushed periodically and their nails clipped. A weekly once over will pick up any problems such as dirty ears, fleas, or skin rashes. These products (below) from Amazon are perfect for grooming any short-haired dog. Or if you prefer, a soft bristle brush works also. Since this is such a rare breed, with such a few member dogs world wide, it is impossible to assess the health status of the breed. It is thought that it is a healthy breed with no health problems being reported. I am Angad Kapoor and I am an I.T. student who loves dogs and is obsessed with them. I have trained many dogs around my place and I really feel happy and satisfied when I spend time with pet dogs, especially training them. Please visit me at Little Paws Training.